Have you ever said a word so many times it begins to sound a bit weird? It’s known as ‘semantic satiation’ and happens when the person saying the word suddenly loses all sense of its meaning. It’s a peculiar phenomenon and one that happens, I believe, to the word ‘Digital’ for so many reasons. 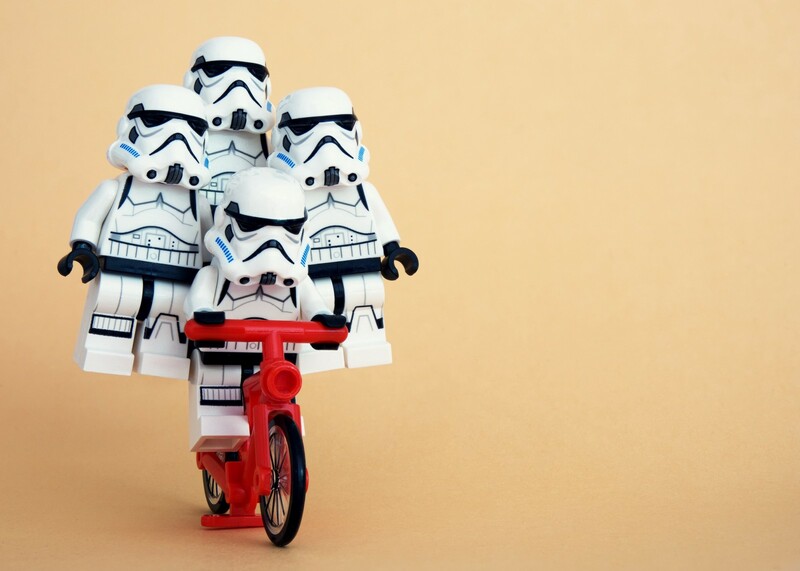 Your organisation will likely have a digital transformation strategy in place and backed up by a digital leadership team and even a digital programme to make it all happen. ‘But’, you may wonder, ‘what is this ‘Digital’ thing and why does it require transformation’? Ask anyone what ‘digital’ means and you will get a variety of answers, a humble dictionary definition will tell you the somewhat bland explanation that it’s “the way computers communicate using binary”. However, in the context of digital transformation, this definition could not be more diametrically opposed to the reality. By understanding that the purpose of digital transformation is to deliver a positive experience we now have a place to hang our ‘digital hat’ so-to-speak and will mean you avoid the trap of semantic satiation! Argument: We all prefer simple digital solutions that solve our traditional problems and provide us with a positive experience, examples include the adoption of uber, Airbnb, Amazon, Netflix, order ahead Starbucks (my personal favourite). Premise: We now expect a similar positive digital experience no matter who we engage with. Conclusion: Organisations must, therefore, exploit digital technologies to transform the traditional experience into a positive digital experience that meets these newly established expectations. 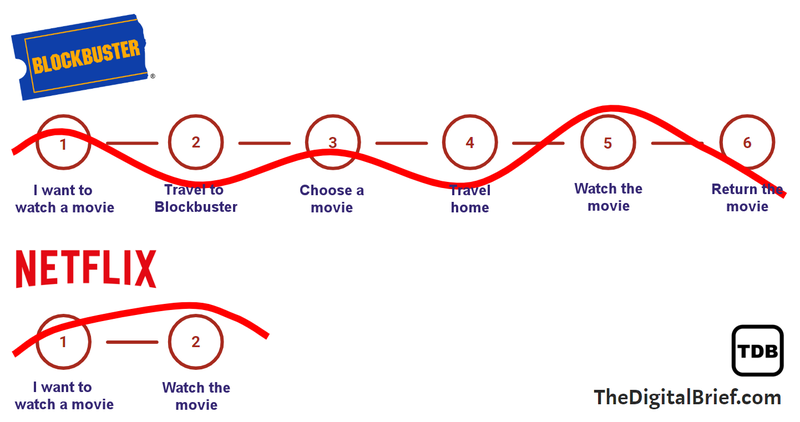 The experience went broadly as follows: (1) I want to watch a movie so we (2) travelled to Blockbuster and we then (3) chose a movie then we (4) travelled home we then (5) watched the movie and finally, we (6) returned the movie — 6 steps in all. So how does this translate into Digital Transformation aside from the fact that Netflix used Internet-enabled technologies? Let’s introduce emotion into the equation. (1) I want to watch a movie so we (2) travelled to Blockbuster in the pouring rain, we arrived but there were no parking spaces so we walked some distance in the rain to the store then we (3) chose a movie, however the latest movie we wanted was all booked out so we had to spend 20 minutes choosing a mediocre movie we had never heard of, we then got back to our car and (4) travelled home and got stuck behind a slow-moving vehicle for some miles, after arriving home we then (5) watched the movie and thought it was ok and finally we (6) returned the movie by travelling back to the Blockbuster store but then realised we were a day late and consequently fined for the privilege of renting a movie we didn’t actually want in the first place. 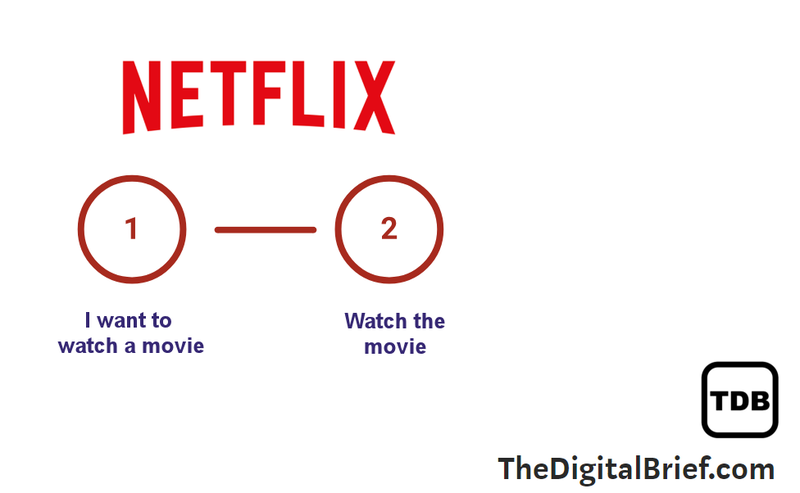 As you will have surmised, by removing all the emotionally negative steps Netflix created a positive digital experience which encourages us to keep going back for more. Even having to choose an alternative movie is no longer a challenge since Netflix will use machine learning to recommend the next best films for you based on your personal tastes and they’re never booked out! Digital Transformation is fundamentally linked to the delivery of ‘experience’ that in itself happens to use digital (internet-enabled) technologies to meet this need. Organisations must deliver a positive digital experience not just to meet these newly established expectations but also to retain their customers. Our expectations are set by the best digital experiences so if that expectation is not met we will simply look elsewhere. The most successful organisations go beyond simply adopting a piece of technology, they deliver a true positive emotional experience by transforming the traditional ways of doing things into simple digital solutions that consistently provide positive outcomes for their customers. It’s at this point that your Digital Transformation journey will truly start and will continue to endure.